Cryopreservation is a procedure in which gametes (sperms & eggs), embryos, blastocysts, ovarian tissue and testicular tissue can be preserved for many years. This facility will reduce the cost of overall treatment procedures, raising the cumulative success rates, since the preserved embryos / Blastocysts could be transferred in subsequent cycles for failed cases without much monitory commitment. There are many reasons that a person may consider undergoing fertility treatment. Sometimes it’s to ensure that they can start a family now, and sometimes it’s to ensure that they can start a family in the future. 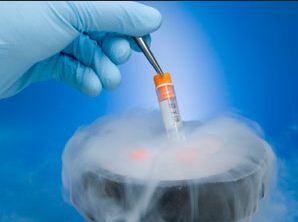 One important component of fertility treatment is cryopreservation. This helps in retrieval and donation procedures and is often an essential part of other fertility treatments. 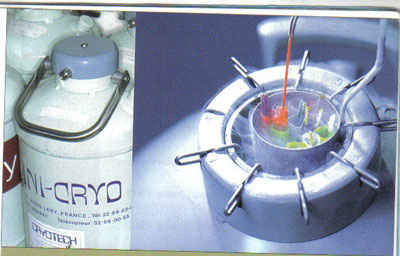 Cryopreservation is a process in which eggs or sperm are frozen at sub-zero temperatures (-150 ?). This helps preserve the embryos or sperm so that they can be used at a later time. When you speak with a fertility specialist, this procedure may come up as part of your treatment. There are two standard methods called slow freezing technique and rapid freezing technique, otherwise known as Vitrification – the latest one. Vitrification helps to form rapid ice crystallization of cytoplasm which preserves cell integrity well. Thawing is a procedure which brings the tissues back to its original room temperature for the purpose of further culture or embryo transfer. Vitrification is the latest procedure adopted in most of the IVF clinics including ours , with fairly good success rates in Frozen Thaw cycles of embryo transfers. Cryopreservation is performed for a variety of reasons. As mentioned above, it’s a great option for people who want to start families. The embryos and sperm are preserved safely at these extremely low temperatures (-150*C), helping to ensure that no cell death or damage at a cellular level occurs. Occasionally there can be cellular damage during the freezing stage, though we have numerous ways of preventing such issues. When preserving eggs for future use, cryopreservation is essential. If a woman would like to preserve healthy eggs at an early age in order to start a family later in life, cryopreservation is used. This is ideal because the chance of birth defects increases as a woman ages. In addition, cryopreservation is essential for the egg donation process, which is one of the most effective treatments for infertility. An egg donor can provide eggs for a couple who will select those eggs in the future. Cryopreservation keeps those eggs viable for future use. Cryopreservation is also essential for preserving sperms for future use. Some men may want to undergo a vasectomy but would like to start a family at some point later on. Cryopreservation will allow this option to be viable in the future. And just like egg donation, sperm donation is greatly assisted by cryopreservation. A man can donate sperm that can be used and selected by a couple at a later time. Because of the regulatory requirements special consent forms have to be completed ahead of the storage. These indicate how long you wish to keep the material in storage for, what you wish the material to be used for and what you wish to do with the material in the event of your death or if you become incapacitated.